Mindblowing funk music with an Italian touch, featuring shredded solos with a pocket tighter than a Fiat 500 seat. The perfect blend of intense Italian melodic music lines together with the energy of the American funk is at the backbone of Sonamo' . Sonamo’ meaning comes from a dialect word from Napoli (ITALY) which literally means “play now!” but it's actually slang for "show me what you got [in a provocative way]”. We dare to change your perception of Italian music by blending funk, jazz, and rock with a Latin twist while keeping the Italian roots at the backbone. As a matter of fact, Sonamo’ performs tunes that have roots in the deepest Italian tradition with African, Hispanic and Middle Eastern influence, since the Italian territory has been colonized by many different cultures throughout the history. Their shows are engaging and full of energy. The musicians are extremely talented and the exciting vibe is contagious and sometimes mesmerizing but easy to listen, in a nutshell, you can dance it or listen to it, you’ll have a blast either way. You have to experience it first-hand to believe. Top notch Italian groove and funk-based music. Sonamo’ meaning comes from a dialect word from Napoli (ITALY) which literally means “play now!” but it's actually slang for "show me what you got [in a provocative way]”. If a Ferrari and Stevie Wonder had a lovechild, they would name it Sonamó. Giuseppe Pinto, Sonamo’s founder, moved to San Francisco in 2010. As a passionate musician from Italy, Giuseppe searched for inspiration in his new city by exploring its eclectic scene and joined several bands and artists. His journey led him to realize that his take on Italian music, with its unknown undertones of world jazz and funk, were very much missing in the American music scene. 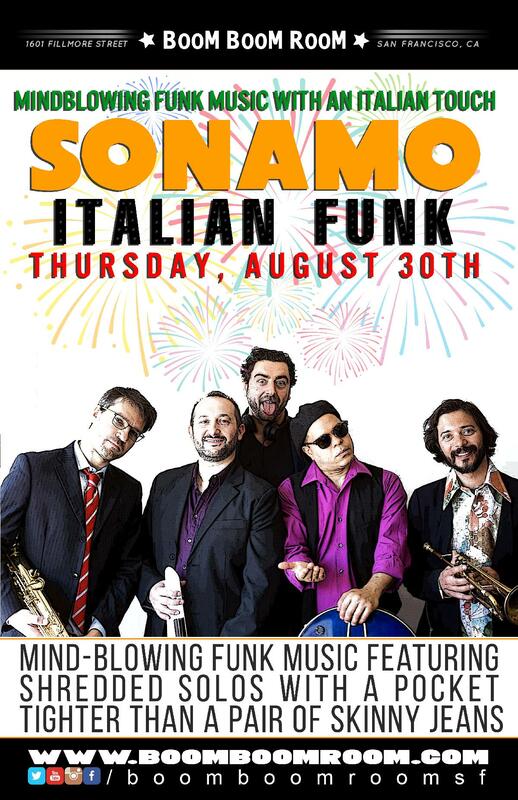 Coupled with creative guitarist Trent Berry, Giuseppe’s dream of putting together a band expressing a smooth blend of Italian and American culture through unpredictable, energetic and passionate music came to life with Sonamo. The band performs tunes that have roots in the deepest Italian tradition with African, Hispanic and Middle Eastern influence, mixing a cultural melting pot with influences of Stevie Wonder, Jamiroquai and Pino Daniele. The band’s name is sometimes used among musicians in Southern Italian as a slang term meaning, “show me what you got!”- and boy, do they ever! Sonamo makes a dynamic, passionate blend of Italian popular music styles- shot through with hefty doses of American funk and jazz creates music that is both danceable yet introspective, at once familiar yet exotic, intense yet energetic, romantic and yet somehow carefree … …in short, music that presses all the right buttons for listeners seeking that something special to light up any occasion and dance the night away.